All you need to know about 5G Technology Coming with 10 Gbps Max Speeds! Till now We have experienced networking upto 4G, where 1G Networking came in the First mobile phone that looked huge! This generation was only for simple calling features. In 1991 Came the 2G with features like Calling, SMS and Data. 3G and 4G were specialised in fastening the Data Transferring speeds, 4G boosts the mobile communications and entertainment features. 4G was said to be up to ten times faster than 3G. Here ‘G’ stands for Generation of cellular mobile communications. So 5G is be the fifth generation of cellular mobile connectivity. It will offer faster data transferring speeds and more reliable connections on smartphones and other devices. 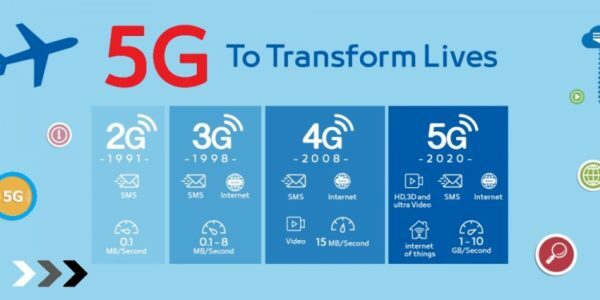 5G targets high data rate, reduced latency, energy saving, cost reduction, massive device connectivity. A latest research says 5G should offer connections that are multitudes faster than current connections, at average downloading speeds of around 1GBps is expected from this Technology. 5G is expected to launch across the world by 2020. A question can rise why we even need 5G while 4G is fulfilling our fast networking needs? The reason why 5G is coming to existence because the no.of variety of devices increasing day by day and connecting to the World through different network connectives, to understand this we can say there is a huge Traffic Jam of devices on the way because no.of path Lanes like WiFi, Bluetooth, Mobile networks.etc are Limited. The Frequency that is being used is 6GHz at maximum. obstacles like walls also in case of cloudy/rainy days the signals with higher frequencies cannot travel easily. But thankfully here we can install low powered 5G small cells which can easily transfer the data to the users. Also in 5G the no.of users will increase so the method of beam forming will be used in Towers, so instead of spreading signal in a whole region the users will be targeted that are using the network and will be specifically given the 5G output. 5G can obviously be used in Smartphones but will take time be integrated, but the Broadband networks will get this Technology first as the implementation is much easily. It is said that the peak speeds can be more than 1Gbps times roughly 23 times faster. Millions of Devices minor or major will connect together. Also the Latency/Ping will be reduced to Zero it is the major improvement over 4G, it is basically the delay for reaching the data from the host to your device. Lower latency could help 5G mobile networks enable things such as multiplayer mobile gaming, factory robots, self-driving cars and other tasks demanding quick response, AR and VR will be a lot improved in video quality and live events because of huge data and low Latency. Stay tuned will Alloftop for more on innovative Technologies.